Leif Ove Andsnes is undoubtedly one of the top pianists of our age. For four years he has been performing and recording the five Beethoven piano concertos, primarily with the Mahler Chamber Orchestra but also with the major conductors & orchestras worldwide - such as Gustavo Dudamel and the LA Philharmonic. Award-winning film-maker Phil Grabsky has been with him throughout. The film is much more than a portrait of a great pianist on tour - it is an in depth exploration into the much misunderstood life of Ludwig van Beethoven, as revealed by these five masterworks. The relationship between Beethoven and his world is mirrored by the relationship between the pianist and orchestra in these concertos. Grabsky's acknowledged skill is biography and he believes that many people know too little about arguably the greatest composer of all time. 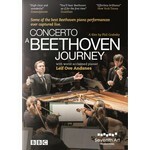 This is an exciting, beautifully cinematic film offering a fresh look at Beethoven through the widely acclaimed performances and articulate insight of the great Leif Ove Andsnes.